Keep everyone at your Thanksgiving table happy with their own serving of pumpkin pie. 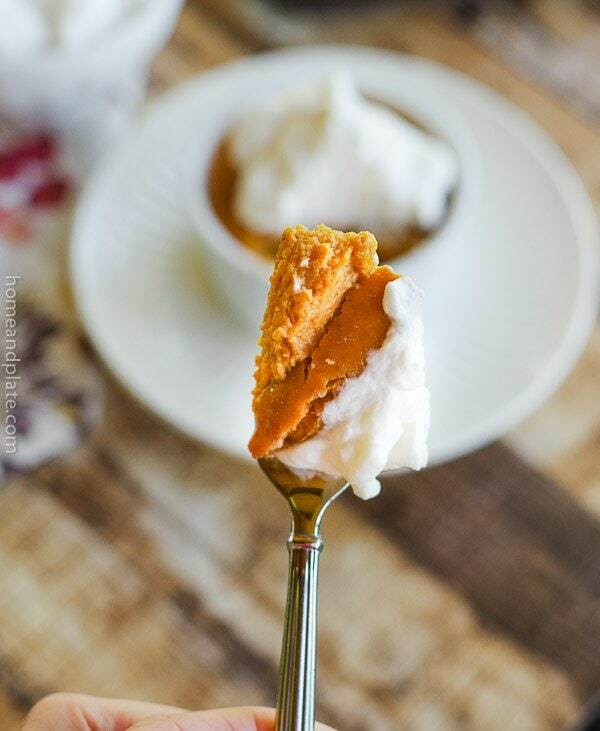 Delicious and gluten free because this traditional pumpkin pie is missing the crust. This recipe couldn’t be easier. The filling took five minutes to mix together. No rolling out the crust! 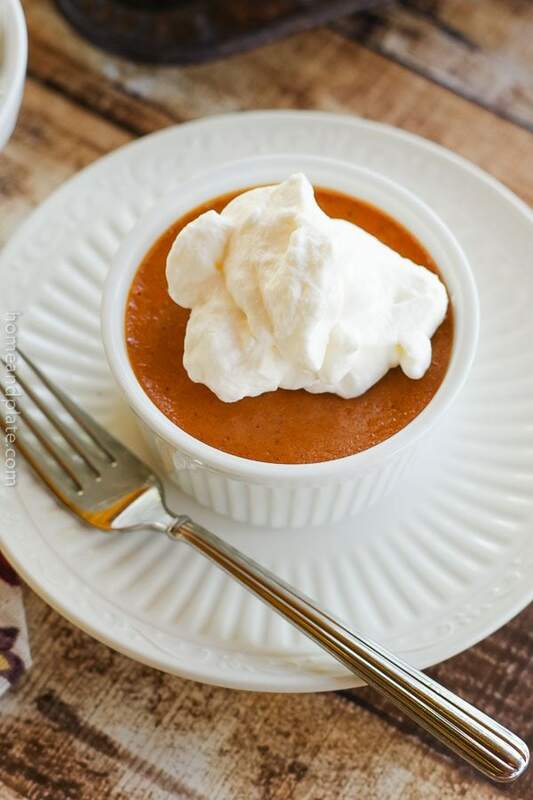 Have you ever baked a pumpkin pie and had the creamy custard crack right down the middle? 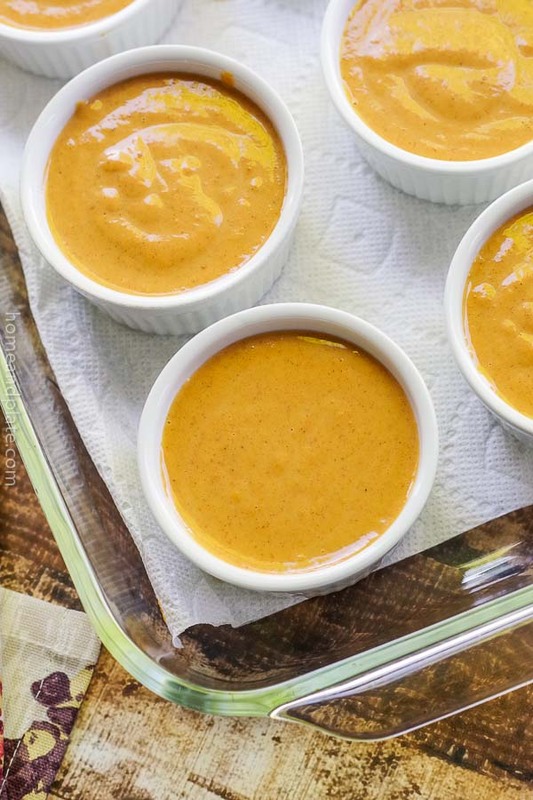 To avoid that, these no crust mini pumpkin pies are baked in a hot water bath. Everyone gets their own serving. Deliciously creamy like custard should be! And suitable for all your gluten-free guests this Thanksgiving. 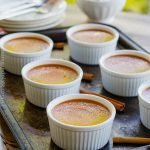 These mini crustless servings take less time in the oven yet still taste like traditional pumpkin pie. 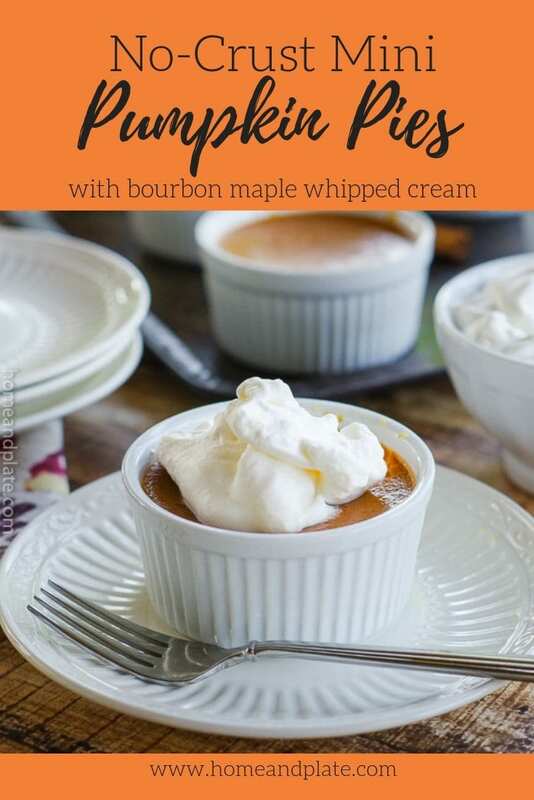 I amped up the flavor by adding a splash of Kentucky bourbon and sweet maple syrup to my whipped cream for an adult dessert. Using a bath helps temper the heat of the oven and adds moisture preventing cracking and a rubbery pie surface. 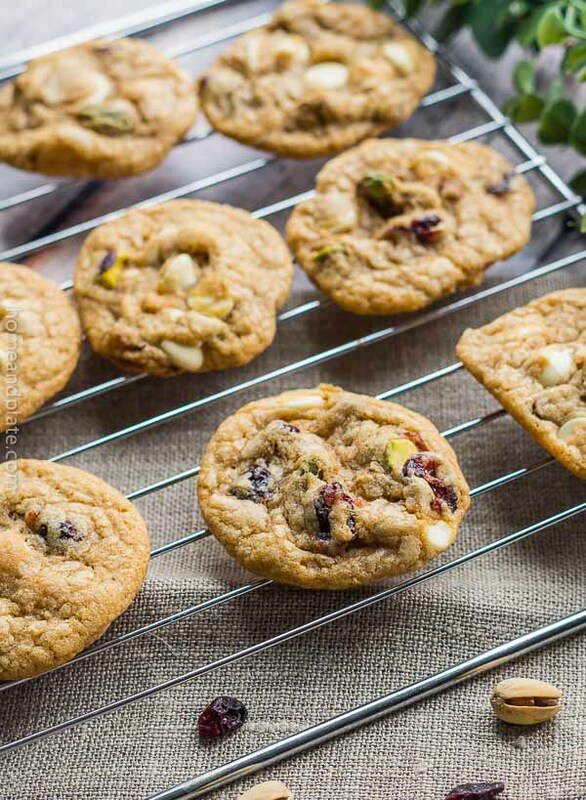 Using a lower heat along with boiling water allows for a more even baking time. Make sure to use boiling water so your mini pumpkin pies cook faster. Use a paper towel in the pan to keep the ramekins from sliding around. Add the boiling water to the pan after you place it in the oven. Remove one of the ramekins from the dish to make it easier to add the boiling water. Preheat the oven to 350°F. Boil a tea pot full of water and set it aside once boiling. Place one paper towel on the bottom of a 9 x 13 inch glass casserole dish. Place six ramekins on top of the paper towel. 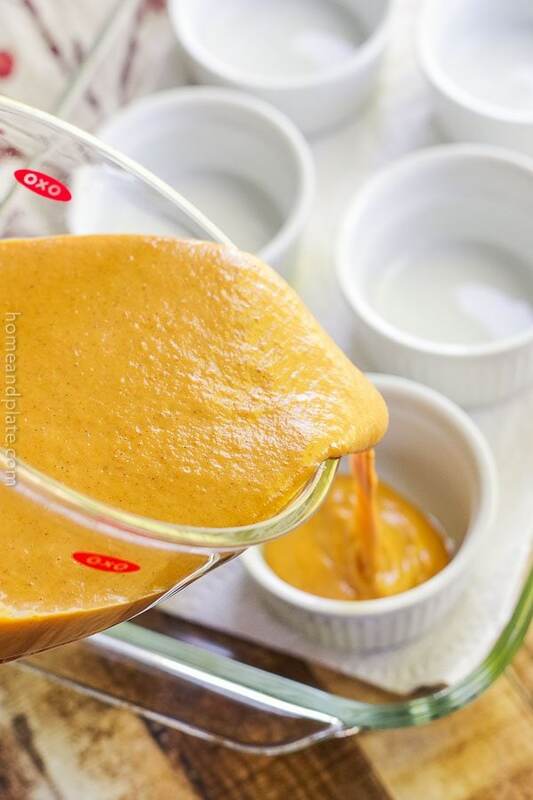 Mix together the pumpkin, sweetened condensed milk, eggs, cinnamon, ginger, nutmeg, salt and vanilla. 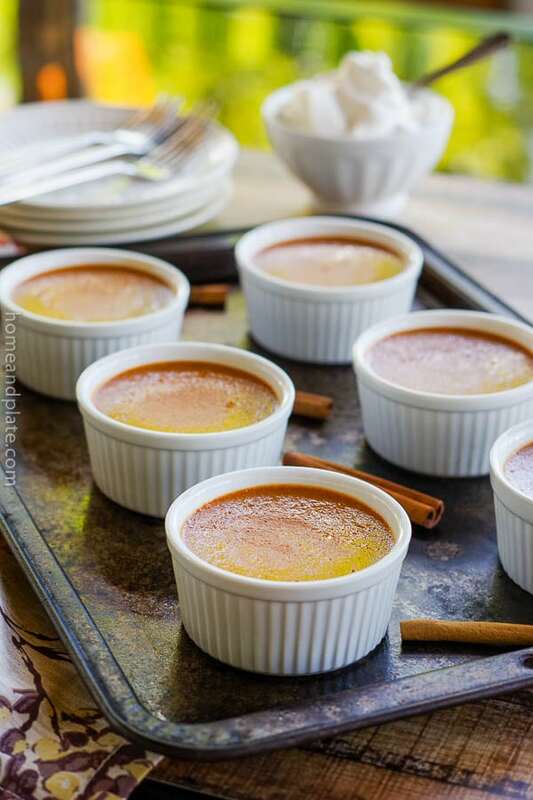 Fill each of the ramekins with the pumpkin pie filling. Remove one of the filled ramekins from the baking dish. Place the baking dish containing the ramekins in the middle of the oven. Pour the hot water slowly into the glass baking dish half way up the sides of the ramekins being careful not to splash hot water onto the pie filling. Replace the missing ramekin back into the pan and close the oven door. Bake for 35 minutes then remove the dish from the oven and allow the ramekins to cool for about 20 minutes on a wire rack. 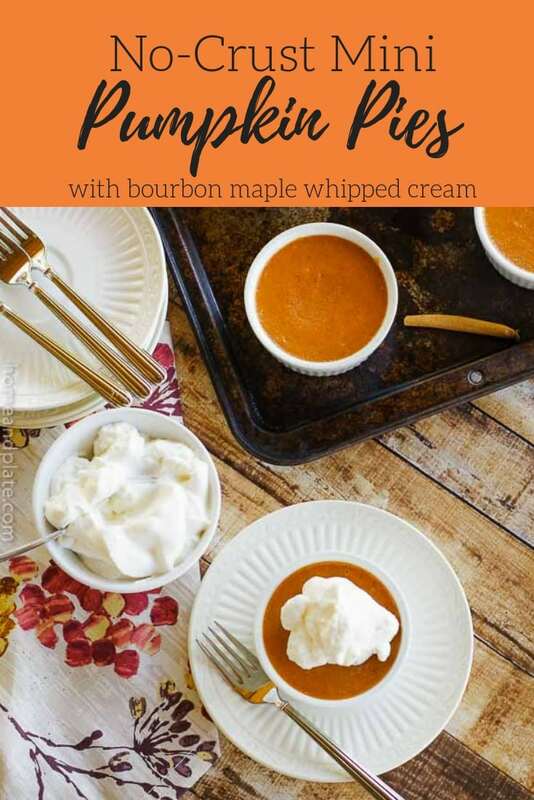 Whip together the maple syrup, bourbon and whipping cream using your stand or hand mixer for 4 to 5 minutes or until soft peaks form. Serve immediately or refrigerate. Serve a dollop on top of each ramekin. Oh those look wonderful – love the sound of bourbon-maple cream – fabulous!! A perfect autumnal dessert. These look like wonderful custards – who needs crust anyway. You don’t miss the crust at all. Thanks Meeta. These are so cute and perfect for a seasonal dinner party. That whipped cream sounds incredible too. 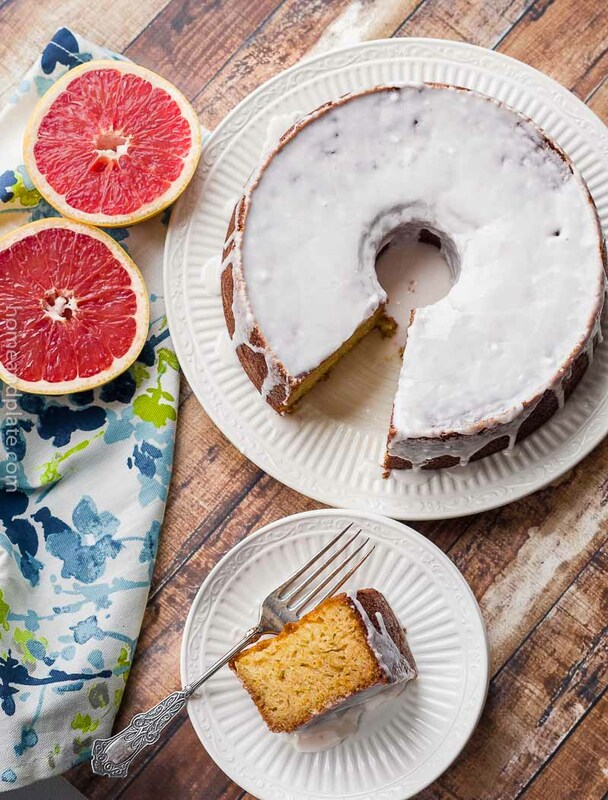 I love the idea of individual servings of pie and even better that these are gluten free. I don’t think there would be any whipped cream left for the pie if I made this! Yum!